Can one metric sum up the biodiversity impact of economic activities? Can businesses set quantitative targets to reduce their impact on biodiversity as they do for climate (e.g. -20% biodiversity footprint by 2030)? How can financial institutions (FIs) assess their exposure to biodiversity impacts throughout their investment?. 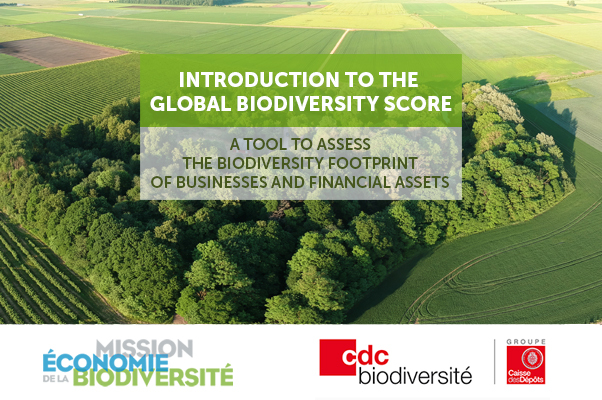 CDC Biodiversité is developing a biodiversity footprint assessment tool, the Global Biodiversity Score (GBS), which seeks to address these questions and make it possible to audit entire companies or financial assets to evaluate their impact on biodiversity. The GBS is developed with about 10 FIs and 20 non-financial businesses, benefiting from extensive road-testing. CDC Biodiversité collaborates with other leading stakeholders in the field of biodiversity footprinting to develop a biodiversity equivalent to the GHG Protocol. One of the first result of this collaboration is the Common ground in biodiversity footprint methodologies for the financial sector (2018) published together with 3 European FIs (Platform for Biodiversity Accounting for Financials or PBAF), and which establishes common concepts and methodological steps to assess biodiversity footprint. CDC Biodiversité would like to invite you to a meeting to present the GBS and the PBAF’s common ground on Tuesday 30/04 in the Caisse des Dépôts’ premises, 15 Quai Anatole France, 75007 Paris, France. Registrations are mandatory through this form.